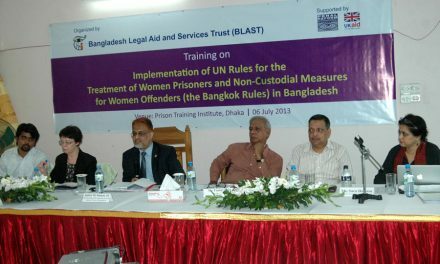 Training on the UN Bangkok Rules for prison officials in Bangladesh provides an insight into the problems faced by women prisoners, as well as some positive progress. Overcrowding in prisons is a major problem in many countries, and Bangladesh is no exception. While there is prison capacity for only around 27,368 people, the system is currently housing 86,000 prisoners. The majority of these – 72% of the total – have not been convicted or sentenced and are awaiting trial. The problem of overcrowding is particularly severe for women, and Dhaka’s central jail currently holds 540 women prisoners, although it only has capacity for 134. The Bangladesh Legal Aid and Services Trust (BLAST), our partner, runs an extensive paralegal service providing legal aid in criminal and civil cases, an essential resource for access to justice. They are also supporting our DFID-funded programme to promote child-friendly justice systems, to develop and expand the use of alternatives to detention, and to improve conditions for women prisoners. On 6 July, BLAST organised a one day training session for prison staff, on implementing the Bangkok Rules for women prisoners. The training was supported by PRI and I delivered sessions on the specific provisions of the Rules and gave examples of good practice from around the world. Many problems faced by women prisoners relate to healthcare and hygiene issues; contact with their families; and rehabilitation and reintegration support. Women prison staff present at the training highlighted some of the difficulties that concern them. There is a lack of sanitary towels for prisoners (the Bangkok Rules specifically state that these should be provided free for the women who need them). Family visits are often uncomfortable experiences, with a lack of privacy and visitors shouting to make themselves heard. While the Rules stress that family visits should be encouraged and efforts made to make them a positive experience (particularly for children), overcrowded conditions make this difficult to manage. Lawyers also complained about the lack of privacy and impossibility of holding a confidential meeting in such conditions. While women prisoners are accommodated separately from male prisoners, prison transport is shared, which was a problem raised by the women prison staff. There are also limited rehabilitation and reintegration programmes for women, although the Inspector General of Prisons was firmly of the view that good training and rehabilitation programmes are essential for successful reintegration and reduction of re-offending rates. However, there are some changes underway in Bangladesh that will improve conditions. A new Prison Act has been drafted that will improve opportunities for leave and early release. It will enable women prisoners to be granted leave so they can keep in contact with their families. Training for prison staff is substantial with the prison training institute providing 3 – 6 months courses for prison personnel, and women staff receiving special training to work with women prisoners. But the most urgent need is to reduce the high level of pre-trial detainees, people who are innocent until proved guilty, but remain in prison due to the complex legal process, large backlogs of cases and poor case management systems. The only legal aid provision is through the paralegal service, which cannot overcome all these institutional challenges.